Star of the Sea Athletics club held a 5km Road Race & Fun Run on back on 13th May 2014. 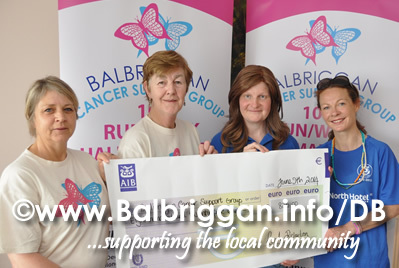 A portion of profits from the race, a whopping €825 was presented to Balbriggan Cancer Support Group and will make a big difference in the services that they provide. Eithne Vettraino & Ann Bissett from Balbriggan Cancer Support with Aileen Keogh & Karen Lavelle from Star of the Sea Ahtletic Club in Stamullen. Congratulations to all of the athletes who took part and a BIG thank you from Balbriggan’s Cancer Support Group.